묘법연화경은 줄여서 ‘법화경’이라고 부르기도 하며, 부처가 되는 길이 누구에게나 열려 있다는 것을 중요사상으로 하고있다. 천태종의 근본 경전으로 화엄경과 함께 한국 불교사상 확립에 크게 영향을 끼친 경전이다. 이 책은 후진(後秦)의 구마라습(鳩摩羅什)이 번역한 법화경 7권 가운데 권3∼4와 권5∼7을 각각 한 책으로 묶은 것이다. 닥종이에 찍은 목판본으로 크기는 세로 35.6㎝, 가로 21.6㎝이다. 표지는 나중에 새로 만든 것으로 보이며, 본문에 끊어 읽는 곳을 알려주는 점이 찍혀있는 것이 특징이다. 조선 성종 1년(1470) 세조의 비인 정희왕후 윤씨가 일찍 죽은 둘째 아들 예종과 더불어 세조, 덕종의 명복을 빌기 위해 간행한 책이다. 이 책은 판을 새긴 후 처음 찍어낸 것이며, 후에 다시 찍은 책으로는 성종 13년(1483)에 찍은 것(보물 제936호)과 성종 19년(1488)에 찍은 것(보물 제950호) 등이 전하고 있다. 왕실에서 주도하였던 까닭에 당시의 일류 기술자들이 참여하여 판의 새김이 매우 정교하며, 인쇄와 보존상태도 양호하다. 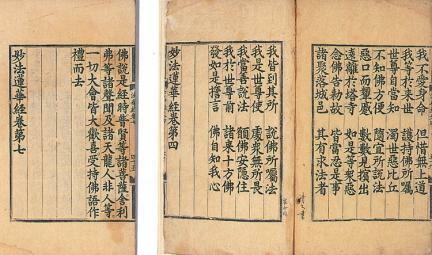 Saddharmapundarika Sutra (Lotus Sutra) is the principal scripture of the Cheontae Order of Korean Buddhism. The main idea of the book is that the way to become a Buddha is open to everyone. Along with the Avatamsaka Sutra (Flower Garland Sutra), this sutra was a principal scripture that wielded great influence on the establishment of Buddhist thoughts in Korea. Saddharmapundarika Sutra was first translated into Chinese by Kumarajiva of the Later Jin; from his translation, Volumes 3 to 4 and 5 to 7 are bound into one book each. Measuring 21.6 cm wide and 35.6 cm long, the books were inscribed on woodblocks and printed on mulberry paper, and the covers were made later. The texts are marked with dots in order to let the readers know where to pause. 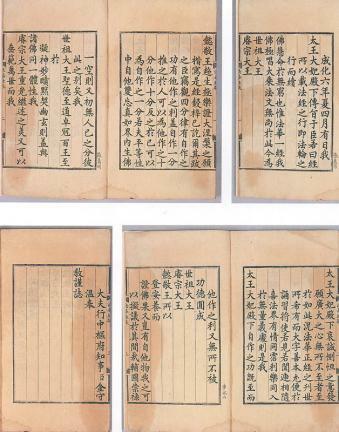 In 1470 (first year of the reign of King Seongjong of the Joseon Dynasty), Queen Jeonghui, wife of King Sejo, ordered the publishing of these books to pray for the souls of her husband and two deceased sons. 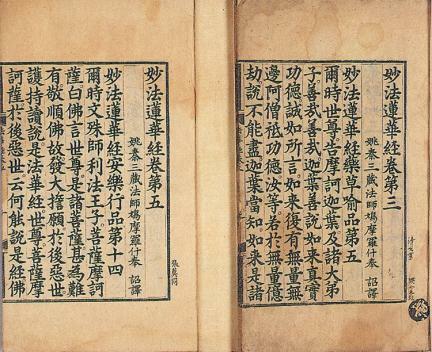 The woodblocks for printing these books were used again in 1483 (13th year of King Seongjong’s reign) and 1488 (19th year of the same reign), and the publications are designated as Treasure Nos. 936 and 950, respectively. Since royal families took the initiative in the publication, the best technicians and craftsmen took part in the project. Therefore, the woodblock printing is very delicate, elegant, and detailed, the printing conditions are excellent, and the books are preserved quite well.